An awareness-raising week is nothing without a good hashtag – so get ready for #GoodDeathWeek #WhatCanYouDo next week: 14-20 May. Final Fling is an online community for end of life planning so we’ll be doing our bit online this year. In the past we’ve held events like Death Cafes, workshops and a Big Conversation gathering. This year over 7 days, we’ll share 7 top tips from Too Busy To Die? our 7 Step Guide to end of life planning. #GoodDeathWeek #WhatCanYouDo are the Scottish and rest-of-UK death movement‘s collective effort to raise consciousness about the importance of planning for the inevitable – death. #GoodDeathWeek is promoted by Good Life Good Death Good Grief, a Scottish network of individuals and organisations. #WhatCanYouDo is part of Dying Matters Awareness Week. Both provide resources and tips and will be on the airwaves raising awareness of death-related issues over the course of the week. Many organisations – from funeral directors to community groups, charities and families – will be doing their bit to tackle any taboo about death, dying and loss. Final Fling’s Barbara wrote Too Busy to Die? and unveiled it at the Cheltenham Literature Festival to a packed house. “It’s the slimmest of volumes because in my experience, none of us want to spend too much of our time thinking and planning for death. We want to get on with living. This book takes the reader through 7 easy steps… simple things to do to sort your affairs. It takes the burden off others and clears your conscience so you can then get back to the fun stuff. It doesn’t take long. Each of the 7 steps comes with a guide to how long it might take. Most are 5-10 minutes. A couple could take an hour. Watch out for our 7 days of posts on Twitter, Facebook and LinkedIn – wherever you get your social media. Follow the 7 steps in our 7 day plan and by 21 May, you’ll be sorted and smug! Search for the hashtags #GoodDeathWeek #WhatCanYouDo to follow the chat about Awareness Week. Need a nudge? See more about the benefits of planning. If you do have a go at planning, we’d love to hear how you get on. Email us. Even better, blog for us about your experience. 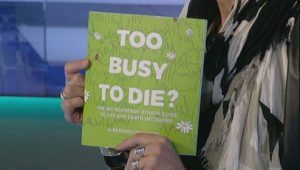 If, like me, you like to have the book in your hand sometimes instead of reading on screen all the time – or indeed like to at least begin the process (#procrastinate) by reading about it – you can buy a copy of Too Busy to Die? It’s only 30 pages and only £5, a light, illustrated read, so it’s an easy investment of time and money. You know it makes sense!